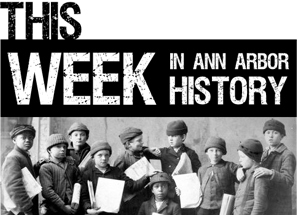 Posted on Mon, Nov 15, 2010 : 12:34 p.m.
Editor's note: This Week in Ann Arbor History looks back at some notable moments from the city's past. The hysteria of the Cold War was still at a fever pitch in the mid-1980s, just a few short years from the collapse of the Soviet Union. No better was that hysteria expressed locally than the fall 1984 push by the Students Against Nuclear Suicide for the University of Michigan to obtain and stock cyanide pills — suicide pills — on campus in the event of a nuclear attack. Students saw their effort as a powerful rejoinder to the philosophy of Mutual Assured Destruction, which led both the United States and the Soviet Union to stockpile enough nuclear arms to wipe each other and everyone else off the map. The Ann Arbor News was not amused. "Stockpiling suicide pills on campus for use in the event of a nuclear war is supposedly serious symbolism. It may also be an empty but flashy attention-getter," the Ann Arbor News wrote in an editorial. "The message that comes across from stocking suicide pills on campus is one of fatalism and helplessness — the latter the opposite of bona fide student activism." But to reader R.F. Burlingame, a retired dentist from Milan, the student effort succeeded in showing the inadequacy of the activism-as-usual approach preferred by The News. "Peacemakers have held prayer vigils, demonstrated, written thousands of letters to newspapers and congressmen, organized candle and torch light parades, picketed missile plants, served prison time, fasted, withheld tax payments and...to what end?" Burlingame wrote. 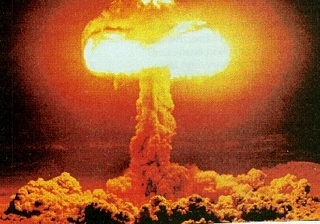 "By equating nuclear war with suicide," the News' Barbara Misle explained in a separate report, "the proposal should encourage people to face the lethal consequences of the arms race on a personal level." The Students Against Nuclear Suicide popped up in Ann Arbor as a copycat effort after a group of students at Brown University began pushing their Ivy League institution to stock suicide pills for students to take in the event of a nuclear attack. The face of Mutual Assured Destruction. Brown students actually approved a ballot measure to that effect before the administration balked. Students at the University of Colorado at Boulder got in on the act next, but their students rejected the suicide pill proposal. The University of Michigan was the third to take up the idea. The effort was never truly about obtaining suicide pills, activists said at the time — it was about fostering a consciousness of the consequences of nuclear war. If stocking suicide pills on campus would open more eyes to the fundamentally suicidal nature of Mutual Assured Destruction, so be it. The University of Michigan disagreed. Provost Billy E. Frye told The News the proposal "even if warranted, is no constructive solution to the problem," and said he was "concerned about the kind of mentality it would generate." Michigan declined the proposal. If the goal had been to get people talking about nuclear war and its consequences, Students Against Nuclear Suicide was successful — if only for a few weeks in the fall of 1984. The 12-member group disbanded in January 1985, according to the Michigan Daily. Patrons of the Ann Arbor District Library have a right to work undisturbed by the body odor of fellow patrons — or at least they have since this week in 1984 after the Ann Arbor Board of Education voted 6-1 to establish behavior guidelines, including mandatory showers. This was back when the library was under the control of the school board and was referred to as the Ann Arbor Public Library. Gene Wilson, who had retired as library director in 1983, told the Ann Arbor News that when library staffers tried to kick out smelly patrons — mostly homeless — the library's lack of a black-letter rule against offensive odors was always thrown back in their faces. "They said 'there's no rule.' I have no problem with the policy, I just regret it had to be written down. The library ought to be open, but somehow minimum standards of behaviors have to be enforced," Wilson explained. Despite challenges from civil libertarians — a statement from the American Civil Liberties Union expressed concern that people whose religious or cultural heritages might eschew deodorant would be unfairly targeted — the use of library resources is still tied to obeying library rules to this day. Rule No. 5 prohibits anyone from "interfering with other library patrons or staff's use of the facilities through extremely poor personal hygiene." 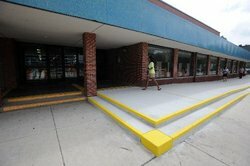 A staffer at the library told AnnArbor.com the policy is still enforced regularly. Technically, first-time offenders are to be warned about bad hygiene, then kicked out for the day. Second-time offenders can lose library privileges for a month, and subsequent violations can draw bans of up to a year. Casting the sole vote against the hygiene ordinance was board of education member Lynn Rivers, who is better known for her four-term tenure in the U.S. Congress from 1995-2003. "It's a subjective decision to determine who is offensive and who isn't," Rivers said. "The problem is we are not willing to apply this policy across the board. Unfortunately, we are applying this to the most powerless group." Thu, Nov 18, 2010 : 10:12 a.m.
Can the policy of the time be quoted? I'm curious how it has changed over time. I was able to find some items on google books about the ACLU and concerns about the homeless that just quote sleeping and poor hygiene which is rather generic. No mention of showers, mandatory or otherwise, and seems similar to what is currently posted that I can find. As Martha states limiting it to clean bodies would be kind of narrow and I'd be surprised if the text would have been approved as such. For anyone else curious here's a page on google books about libraries and the homeless including AAPL and Dallas. Tue, Nov 16, 2010 : 10:21 a.m. If this is such a problem, maybe you should install washer &amp; dryers for their use at the Library - many offensive odors are carried in people's clothing, even over a clean body!!! Tue, Nov 16, 2010 : 7:43 a.m.
"I wonder if this is ever enforced in corporations though..." Yes. Indoor pollutants. Tue, Nov 16, 2010 : 1:10 a.m.
Mon, Nov 15, 2010 : 6:39 p.m.
All right, all right, fellow commenters. I no longer see "Library vs. odor" as something to laugh about at work, posting the article on the bulletin board there to share with others. Not that I did it back in 1984, but a co-worker did. I forgot what year it was posted at work for laughs. Nobody came forth and expressed just how serious the situation really was. We wouldn't want to be using the library's computers sitting next to someone with strong distracting odors today. Mon, Nov 15, 2010 : 5:21 p.m.
"Security staff will provide a warning and inform the person, if needed, where they can go to maintain personal hygiene. " Where? Mon, Nov 15, 2010 : 4:08 p.m. I have witnessed those who have defecated and urinated in their clothing and walked right in to have a seat in the 5th Ave. branch. Good law as far as the rest of societh is concerned. Mon, Nov 15, 2010 : 3:08 p.m.
Staff at the AADL may not make a complaint about a patron's offensive odor, complaints are only investigated when made by a patron. After a patron makes an official complaint, two staff members must confirm that the situation should be further investigated. If a patron does not wish to make a formal complaint, nothing will be done with regards to the person who may have had an offensive odor. Security staff will provide a warning and inform the person, if needed, where they can go to maintain personal hygiene. A full list and explanation of the rules of behavior at the AADL are readily available at all locations. Mon, Nov 15, 2010 : 2:28 p.m.
@Speechless: I hope that was satire LOL. I don't think they were after suits that were late to work or the occasional hippie that thinks Patchouli smells great in large doses. Have you ever tried to read a book when the person sitting next to you actually smells like diarrhea and urine? Now that's difficult. Mon, Nov 15, 2010 : 1:56 p.m.
Over the past 25 years, there have been some occasions when, upon waking a little late, the shower was skipped in order to get to work on time. At the end of a such a day, a stop may have been made at the library. I had no idea that such mundane visits were fraught with high risk! A staff librarian with an ultra-acute nose could have punted me onto the sidwalk at any time. Had counter-protests been organized at the library in 1984, they would have merited a special twist done in the style of Chicago community activist Saul Alinksy. For example, send in a group of 40-50 otherwise well-washed, well-dressed protesters who have each saturated themselves with overwhelming quantities of perfume or patchouli. Proceed to fan out across the library and ask available staff for help on detailed book searches. Request arrest if subsequently confronted, and later on drive city police out of their own jail.